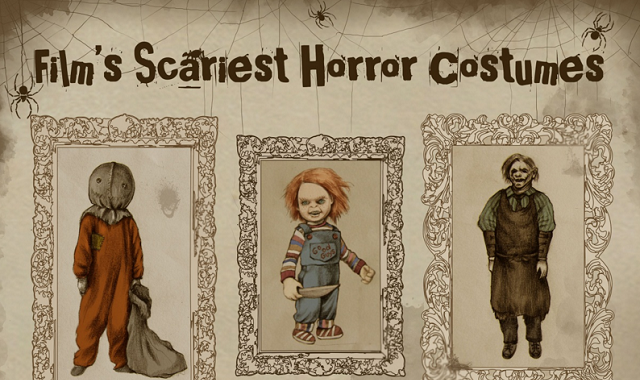 Film’s Scariest Horror Costumes #infographic ~ Visualistan '+g+"
So, which horror movie villain’s costume is scariest? Can there ever be an objective answer to this? Some find clowns like Pennywise from Stephen King’s It to be frightening. Others get the creeps from slow-shuffling zombies, closing in on their next meal of human flesh and organs. Many even find the everyday clothes of Norman Bates or Hannibal Lecter scary, just because they’re able to hide in plain sight. So, what is it that makes these characters’ costumes and mask so scary? Well, there are several factors to consider, and different people will find a particular theme more scary than another. Innocent-looking playthings that become sinister murdering machines are bloodcurdling; monsters that have human bodies but disfigured faces are unnerving; and creatures than are physiologically different to humans in their entirety are downright chilling. Well, whichever creature of the night you find scariest, we are sure that you will see most of the iconic ones in this infographic. Some costumes are even from movies that many people don’t often find particularly frightening - think the Stay Puft Marshmallow Man from Ghostbusters.